In China, the origins of food often begin with a fairy-tale. 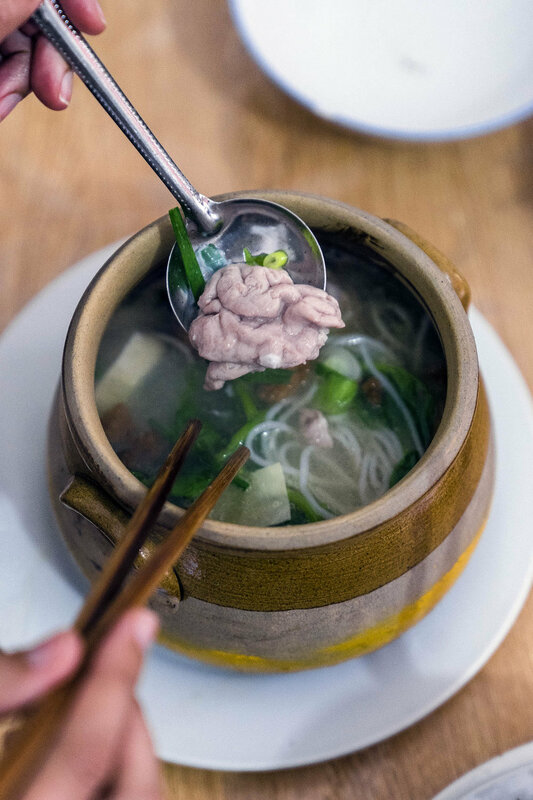 There’s the story of the Fujian hotpot ‘Buddha Jumps Over the Wall’, a dish comprised of more than 30 ingredients and so aromatic it’s said even Buddha was tempted to stop meditating, follow his nose and jump over a wall to find this fragrant soup. From Hangzhou there’s the clay-baked ‘Beggar’s Chicken’, named after a hungry, homeless man, who stole a whole cooked chicken and buried it in mud so it wouldn’t be found. Upon digging his prize out from the earth, he discovered that, cooked in the sealed muddy layer, the chicken was succulent and delicious. 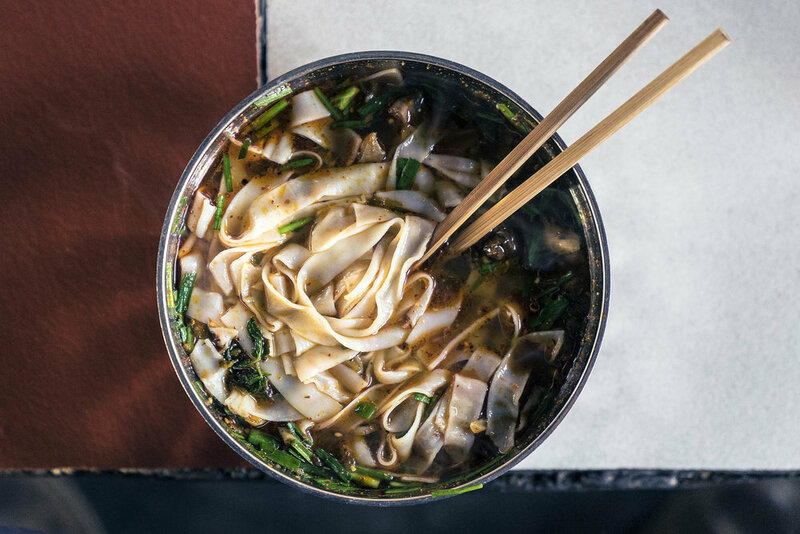 Our quest to uncover a bowl of authentic Yunnan rice noodles was intrigued by its own fable, a story of true romance: the effort one wife will go to ensure her husband’s rice noodles don’t become soggy. 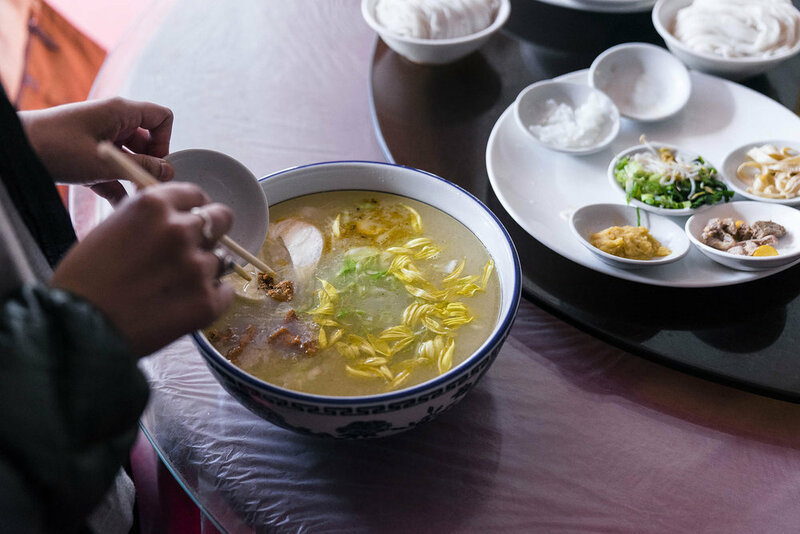 If you ask a local what you should eat while you’re in Yunnan, a vast province in China’s South West, the first thing they’ll say is guoqiao mixian, the literal translation: 'Crossing the Bridge Noodles’. The story of these beloved noodles begins with a couple who lived by the waters of a beautiful lake, known to attract scholars from across the country who yearn to strike wisdom among its peaceful beauty. In the centre of the lake was an island, where the husband studied madly every day away from his home. His wife, the heroine of this tale, grows frustrated that the long journey over the bridge to provide her hubby with a home-cooked meal always leaves her lovingly prepared noodles cold, soggy and uneaten. Taking pride in her food, she comes up with an ingenious, if not laborious, plan: she fills a clay pot with the broth and layers a slick of oil on top to insulate the soup. The noodles and each of the remaining ingredients were kept in their own separate containers so the husband could mix the steaming soup together himself. It was brilliant. Our first encounter with these noodles began in Mengzi, a small city just south of Yunnan’s capital, Kunming. Home to a sparkling jade-coloured lake, Mengzi, by all accounts, is believed to be the home of this creative couple; the place where guoqiao mixian is said to originate. This was where I knew Leigh and I had to begin our rice noodle initiation. A friend had pointed us in the direction of Huaguang Hotel. 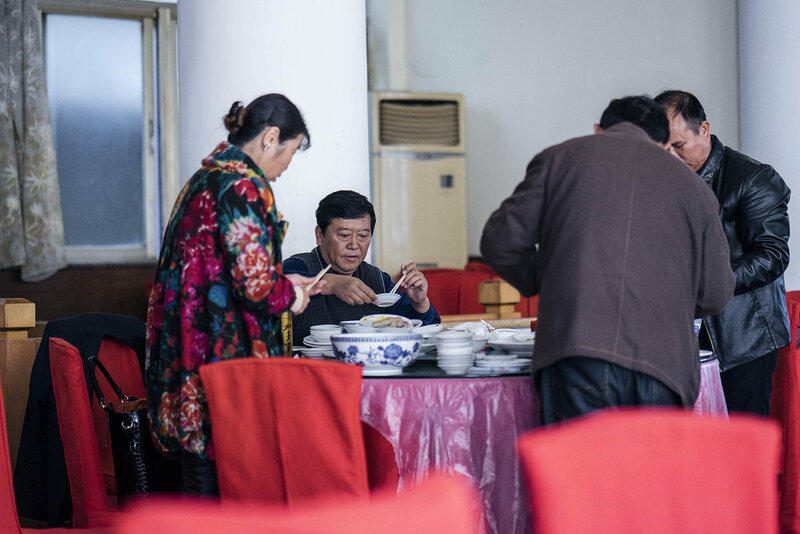 While the hotel is now defunct, the lavishly-dressed, cavernous dining space is still packed each morning by Mengzi locals who come solely for a giant bowl of Huaguang’s famous noodles for their breakfast. The quoqiao mixian they serve here isn’t just the noodle, meat and broth combo like it was in the days of the fairy-tale couple, now it’s a minimum of 15 different plates, up to 40 if you’re feeling fancy. 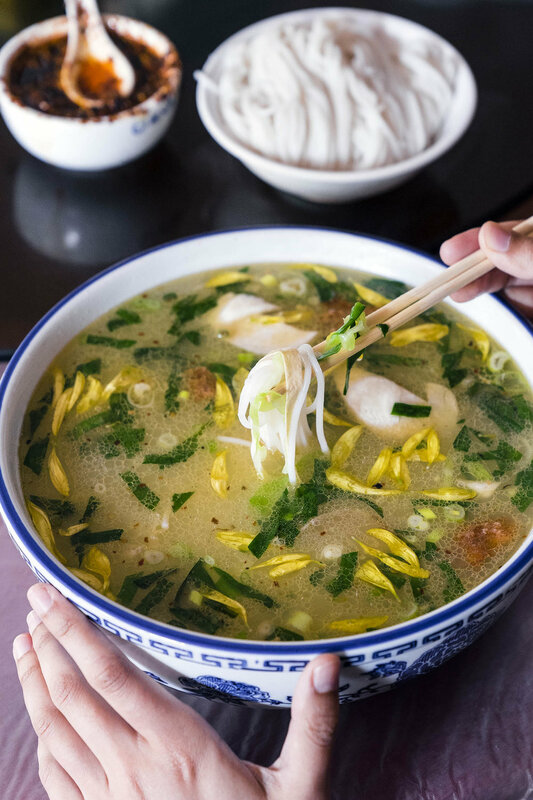 Never wanting to seem too stingy or too extravagant, we went for a humble 30-plate serving, the hot chicken-based broth served alongside plates of raw chicken, pork, ham, various fish slivers, pickles, scallions, chives, greens, herbs, mushrooms, raw quail eggs and chrysanthemum petals. Despite my best efforts, I looked, as I often did in China, a little perplexed at the lavish feast laid before me. A couple on a nearby table pointed at my accompanying plates, indicating the meat was to be cooked first while the broth was at its hottest, followed by the eggs, the noodles and finally the greens. The bowl of soup was more like a bucket, obviously meant to share. As each ingredient tumbled into the steaming, cloudy broth, it disappeared swiftly, sinking into the bottom of the bowl to cook. The soup was surprisingly mellow, lacking the warming spice of most of the noodle soups we’d ordered in my travels through China, but with a richness that complemented each added ingredient without overpowering them. The pickles brought a sour tang and crunch, the herbs cut through the oily stock and the noodles were tender and chewy, just as they were originally intended. It was a satisfying breakfast, an unfinishable one, too. But there were plenty more rice noodles to try on this mission of mine. 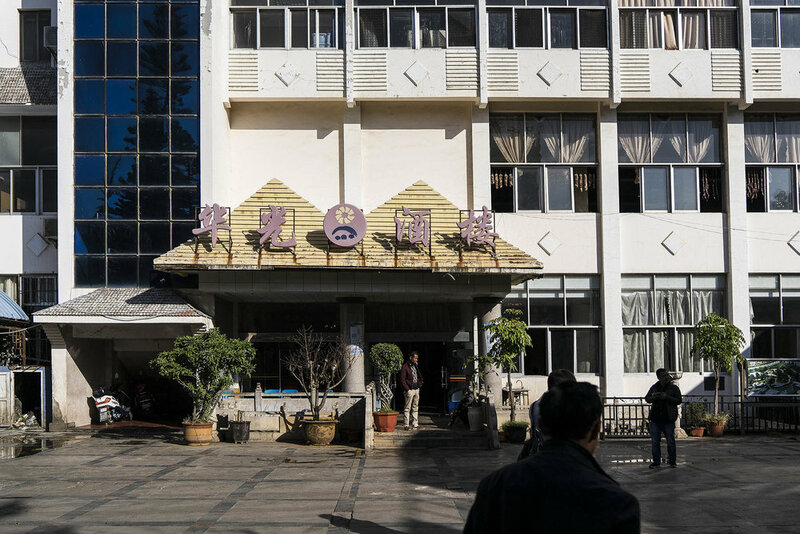 We were invited to the city of Kaiyuan, just one hour north of Mengzi and home to some of the more experimental rice noodles in Yunnan. Here, thanks to our new friends Bai and Vienn, we tried guoqiao mixian of every kind. 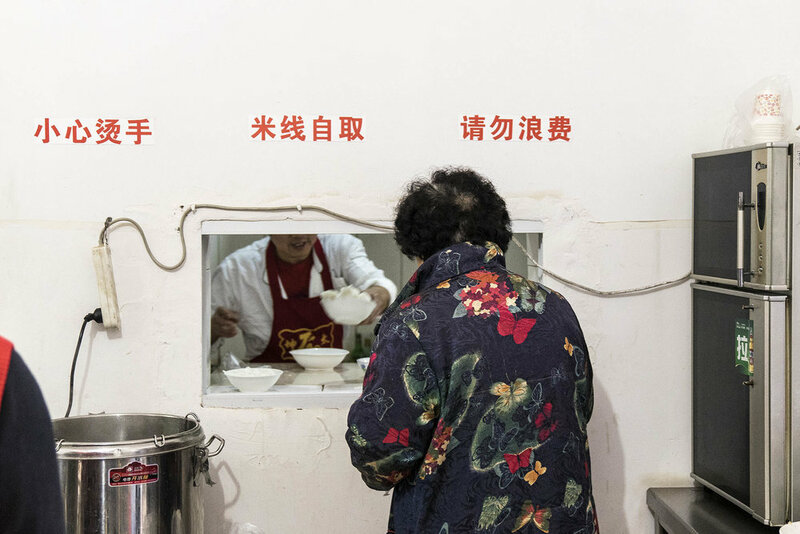 There was a spicy pork bowl, served up canteen-style by a bunch of elderly ladies who stood behind a steamed-up glass wall, shovelling in all your ingredients for you. 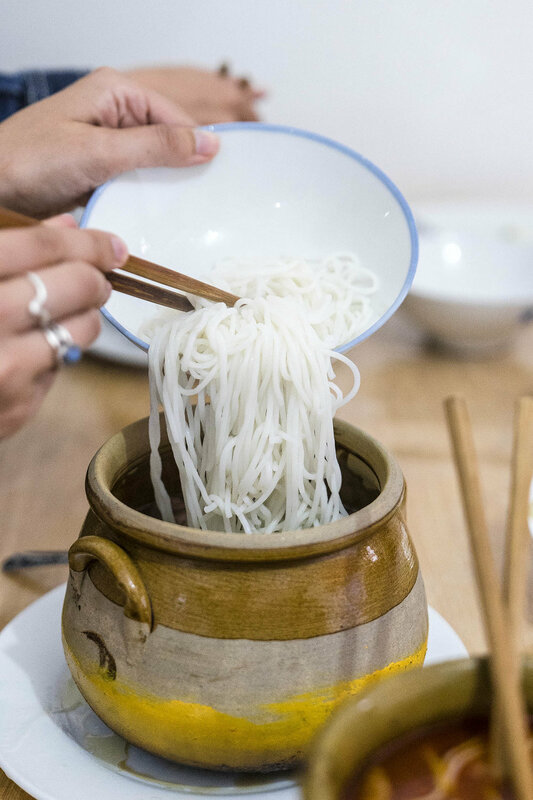 We tried eel rice noodles and even pig’s brain rice noodles, a favourite in town served in a traditional heated clay pot. The soft, creamy brain was surprisingly inoffensive, sliding down my throat like a sliver of silken tofu. But I needed to dive further into this dish, I needed to find what was so special about these rice noodles. We made a visit to Lingquan noodle factory in the centre of Kaiyuan, where many restaurants in town source these coveted, chewy noodles. Bai introduced us to the owner, Shang Le An – her name translating to happiness and peace. 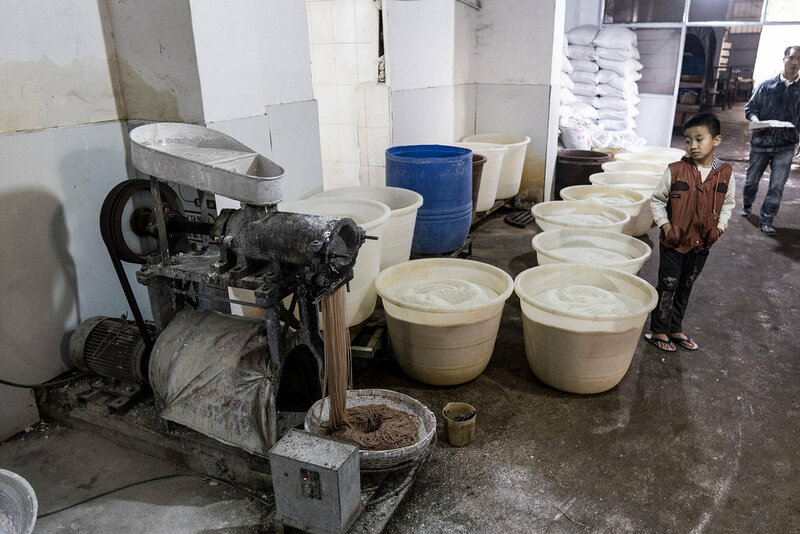 Using a combination of just water and rice flour made from the ground grains of Yunnan’s famous red rice, we watched as the gloopy mixture was poured into their aging, flour-dusted machines and came spiralling out the other end as long, stretchy noodles. Shang Le An tore off a bunch of fresh strands for me to try. They were hot, sticky and chewy – full of earthy flavour and a meal in themselves. Before we left her factory, Shang Le An invited us to lunch, offering to cook up some rice noodles before we had to head back to Kunming. 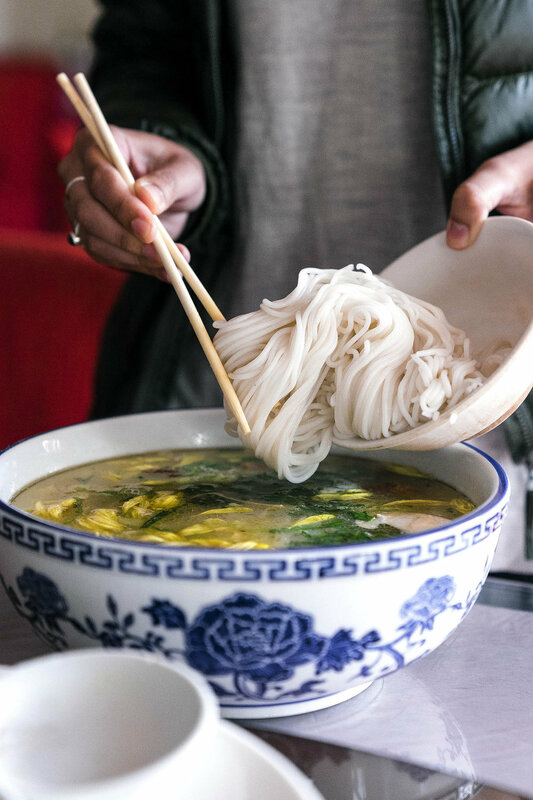 As we slurped down yet another bowl of these tender, tasty noodles, I could see just how much pride this community take in preparing this dish. While the Crossing the Bridge story may be a fictional tale, the message is an important one throughout China. At the end of the couple’s story, the husband becomes a revered Imperial scholar, reaching his goal with the support of his loving wife. Sure, the relationship dynamic may be a tad on the traditional side, but the story itself represents how affection and endearment, as well as diligence and hard work, is the path to excellence. Some use food simply for nourishment, some eat for pleasure and some eat for pain; I found the Chinese often take their food with a healthy side of morality. Such virtuosity and wisdom, such honour and inspiration – all this from a bowl of noodles.